When you’re building your household emergency kit, be sure to take your pets’ needs into account. After a disaster, you may be on your own for several days before utilities and businesses are restored and outside help arrives. 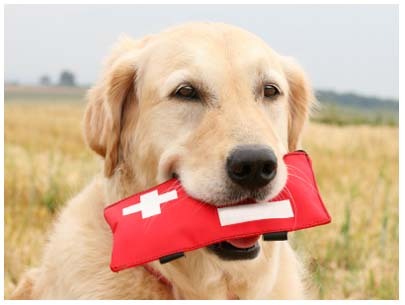 A pet emergency kit should contain enough supplies for at least three days, and preferably a week. It also should include everything you’d need to take care of your pet if you had to evacuate your home and go to a hotel, a friend or relative’s house, or another location without your usual toys and care items. Select a container that’s sturdy enough to handle evacuation and large enough to hold everything you need. But don’t load it down so it’s too heavy to lift! Make sure your kit fits in your vehicle (with all your other emergency supplies) in case you have to evacuate with your pets. If you have a large, healthy dog, consider buying a dog backpack or saddlebag, like those used by outdoor enthusiasts who take their dogs hiking. Have your dog carry some of his own supplies. But make sure he’s used to the pack beforehand. Store your kit with your other household emergency supplies so you can find it when you need it.